X Architecten of Linz and Vienna, Austria, have completed a dental clinic that is based on an illustration of a set of teeth. 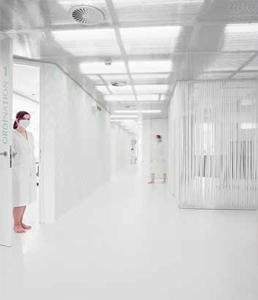 The GKK Dental Ambulatory, for the Upper Austrian regional health insurance company, ispredominantly white with touches of mint-green,representing both the client’s corporate colours and afresh, toothpasty vibe. The clinic also has a curved reception area representing a throat, and a red seating area suggesting a tongue. The general tone, created by the use of the colour white, is experienced by the visitor right from the doorstep. A white and soft PVC floor coating and a transparent back-lit ceiling made of polycarbonate web plates compensate for the reduced daylight in the hall andwaiting area. The rolled-on pattern on the walls, as well as the mirrored “mouth hygiene” area with its display cabinets, completes the friendly and almost glamorous character. The latter was coated with PVC rods reminiscent of the bristles of a toothbrush making it a success aesthetically as well as conceptually. This interpretation is successfully continued with a curved reception and seating area with desk and bench representing the throat, complemented by a red seating element as the tongue.